You’ve probably seen all sorts of amazing stuffed avocado recipes floating around on Pinterest, Instagram and various food blogs. 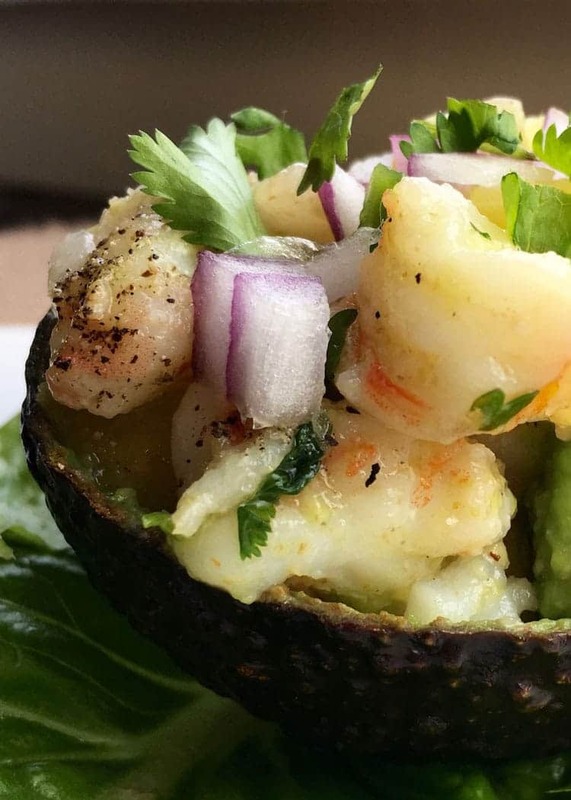 This Pineapple Shrimp Stuffed Avocados recipe is another avocado recipe that you are going to want to try. It’s a fabulous, completely unique recipe that you’ll love. And seriously, when you combine shrimp and pineapple with our favorite ingredient, avocados…well, you absolutely cannot go wrong. These delicious pineapple-stuffed avocados are perfect as a healthy lunch entree or a light dinner – especially on those warm summer days when you don’t want to spend much time in the kitchen! We really enjoy tasty avocado recipes. Seriously, we can’t get enough of them. Just take a look at Sweet Corn and Avocado Salsa, Avocado Mango Salad and Avocado Soup with Feta. 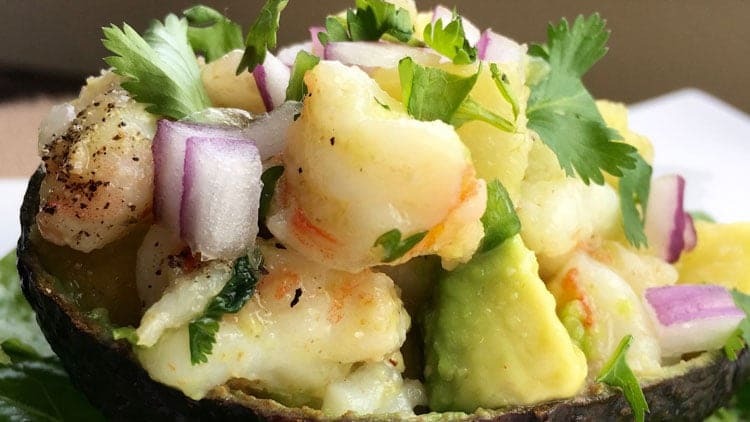 Pineapple-Shrimp Stuffed Avocados make a perfect side dish to serve with a wide variety of grilled meats. We especially like it with Grilled Pork and Pineapple Kabobs, Grilled Chicken Kabobs, Perfectly Grilled Chicken Halves. Add salt and pepper to our stuffed avocado salad for the perfect seasoning. 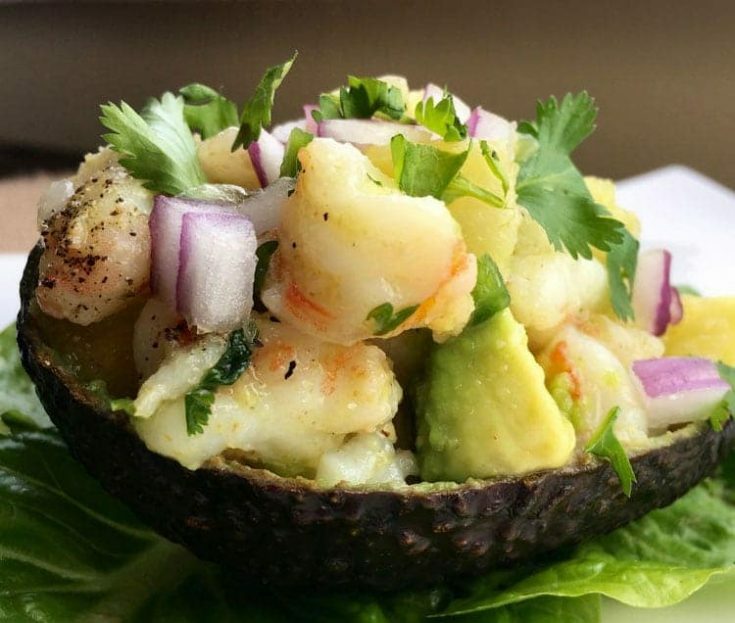 Sprigs of cilantro compliment the flavor of the avocado and shrimp, making this a meal you’ll want to savor. Delicious stuffed avocado recipe that can be served for dinner or lunch or as a side dish. Heat olive oil in a medium-sized skillet over medium heat. Pat the shrimp dry with paper towels and add to the hot skillet. Add ground cumin and season with salt and pepper, to taste. Cook shrimp for approximately 2-3 minutes, stirring frequently. Remove pan from heat and add 2 tablespoons of fresh lemon juice. Stir to combine and transfer to a small bowl. Cover and place in the refrigerator to chill. Cut avocados in half lengthwise. Remove seed and score the flesh in evenly spaced rows lengthwise and crosswise to create equal-sized chunks. Scoop avocado out of shell and toss with remaining 2 tablespoons of lemon juice to prevent browning. Reserve avocado shells and set aside. Add avocado, pineapple, pineapple juice, onion, and cilantro to a large non-reactive bowl and stir gently to combine. Remove chilled shrimp from the refrigerator and chop into equal-size chunks. 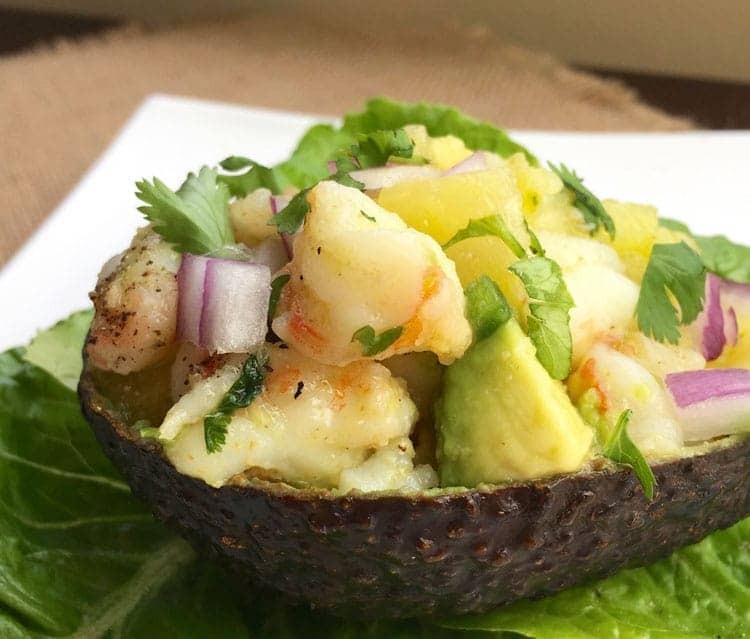 Fold shrimp into avocado-pineapple mixture. Season with salt and pepper, to taste. Spoon shrimp mixture into reserved avocado shells and serve immediately. Enjoy!